2GB DDR3 PC3-10600U 1333MHz DIMM For Desktops - Mixed Brands - Used - 1 Year Warranty..
Refurbished 2GB DDR2 DIMM 800MHz Desktop Memory - Tested - 1 Year WarrantyMemory Module Manufacturer..
CORSAIR Value Select 2GB 240-pin DDR3 SDRAM 1333 MHz - VS2GB1333D3Product Type: RAM memoryCapacity: ..
Refurbished 4GB DDR3 SDRAM DIMM 1333MHz (PC3-10600) - 240-Pin - Mixed Brands - Non-ECC Unbuffered - ..
Refurbished 4GB DDR3 SDRAM DIMM 1600MHz PC3-12800U - 240-Pin - Mixed Brands - 1 Year Warranty - Non-.. 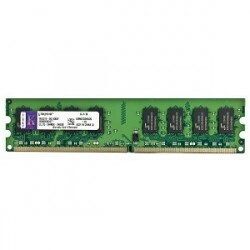 Team Elite DDR3 4GB RAM DIMM 240pin 1600MHz / PC3 - TED34G1600C1101 Memory Type: DDR3 SDRAM - DIMM .. Compatible Part Numbers: Hynix: HMT451U6BFR8A-PBSamsung: M378B5173EB0-YK0Micron: MT18KSF51272AZ-1G4M..
Crucial DDR4 4GB RAM DIMM 288pin 2400MHz / PC4 - CT4G4DFS824AProduct Description: Crucial - DDR4 - 4..
CORSAIR ValueSelect 4GB 240-Pin DDR3 SDRAM 1333 Desktop Memory Model CMV4GX3M1A1333C9ModelBrand: COR.. Transcend - RAM Memory - 4GB - DDR3 - 1600MHz - DIMM - 240pin - PC3-12800U - 1.5V - Dual Rank - CL11..
Corsair Value Select DDR4 4GB DIMM 288pin 1.2V - CMV4GX4M1A2400C16Product Type: RAM memoryCapacity: .. Product Description Corsair Value Select - DDR3L - 8 GB - DIMM 240-pin Product Type RAM memory ..
4GB DDR3 ECC Registered RAM for Workstations & Servers - Refurbished - 90 Day Warranty .. Team Elite DDR4 4GB DIMM 288 pin 2133 MHz / PC4 - TED44G2133C1501Memory Type: DDR4 SDRAM - DIMM 288-..
Corsair Value Select 8GB DDR3 DIMM 240-pin 1333MHz 1.5V - CMV8GX3M1A1333C9Product Type: RAM mem..